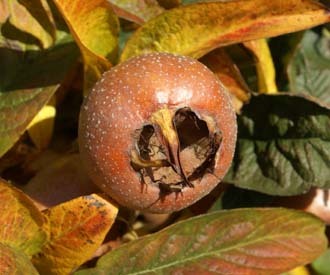 Medlars were at one time a very popular winter fruit in England. However today they are almost unknown and even regarded with some suspicion. 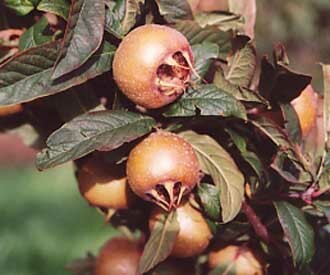 We are sure that if you give medlars a chance you will grow to love them as we do. Medlar trees are easy trees to grow that do well in most parts of the country. They have much to offer in addition to their fruit. They form bushy trees with interesting contorted, spreading branches. They have attractive large white blossom in late spring and the most spectacular gold and red autumn foliage of any fruit tree. 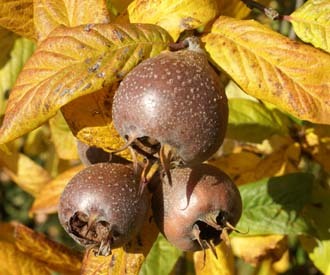 Further information on medlar trees can be found on Medlar Trees Advice Page. 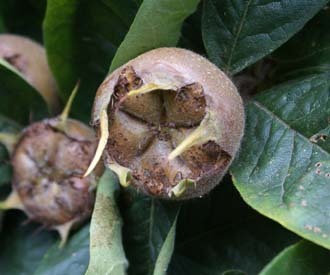 The best known variety of medlar in the UK. A good quality late ripening medlar with sweet creamy flesh. One of the best late ripening medlars.